SpaceX conducted a successful Falcon 9 rocket static fire test March 8, 2014, in support of its upcoming Commercial Resupply Services-3 (CRS-3) mission to the International Space Station. Preparations are now underway for the launch of Space Exploration Technologies' (SpaceX) third cargo flight to the International Space Station — including the release of the mission's official patch. During SpaceX's Commercial Resupply Services 3 (CRS-3 or SpX-3) mission, the Hawthorne, Calif.-based company's Dragon capsule will carry almost 5,000 pounds (2,300 kilograms) of supplies to the space station and return home to Earth with more than 3,500 pounds (1,600 kg) of science results and spent equipment. This launch will set its own firsts, too. The Falcon 9 rocket lofting the Dragon into orbit is outfitted with SpaceX's first set of landing legs, although the company intends to only test their deployment on the booster's first stage before attempting an engine-slowed, "soft landing" in the ocean. Eventually, SpaceX hopes to recover and reuse its Falcon rockets' first stage by having it touch down on land. 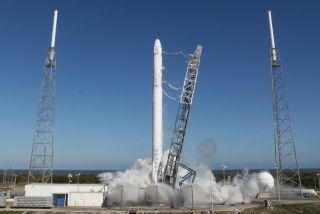 SpaceX successfully tested the first stage engines during a brief static firing on Saturday (March 8). The nine Merlin 1D engines give the Falcon 9 the '9' in its name. Many of the CRS-3 mission's milestones are depicted in the patch designed for the flight. The three-sided emblem — three sides for the third supply mission — depicts the Dragon, the Falcon's second stage and the International Space Station above the Earth. Starting at the left of the patch, the rocket's upper stage is shown with five small orbs, each symbolizing the CubeSat satellites that will be deployed as the mission's secondary payload, a SpaceX spokesperson told collectSPACE. At the top center of the insignia, the station is represented with beams extending down to Earth. Among the science experiments the Dragon spacecraft will deliver to the orbiting lab will be OPALS, or Optical PAyload for Lasercomm Science, which will test the potential for using a laser to broadcast data to the ground from space. According to SpaceX, the beam on the patch symbolizes OPALS transmitting information to NASA's Jet Propulsion Lab in California, where the experiment is based. On the right of insignia, the Dragon is shown returning to Earth at the end of its CRS-3 mission. Below the capsule, the state of Florida is highlighted, signifying the capsule's launch site. Finally, at the bottom of the emblem is a four-leaf clover. The symbol for luck, the clover has become a regular icon on SpaceX's flight patches ever since the company's first successful Falcon 1 launch in 2008, which also featured a clover "for luck" on its patch. Like the previous SpaceX CRS flights, CRS-3 also has a NASA-designed insignia as well. The space agency's triangular emblem shows the Dragon berthed to the station. OPALS is included on the emblem, as is HDEV (High Definition Earth Viewing) which will test commercial HD video cameras launched on CRS-3. The Dragon will take two days to reach the space station, where it will be captured by the outpost's robotic arm. The capsule is slated to remain attached to the station for one month before returning under parachutes to a splashdown off the coast of California. Click through to collectSPACE.com to see SpaceX’s and NASA’s mission patches for the SpX-3 (CRS-3) cargo flight to the International Space Station.